Only last week, for example, we learned that all 4,190 Launch Edition Gladiators sold out in only one day, each priced at over $60,000. Prices for the base Gladiator start at $35,040 while the Sport S trim begins at $38,240, Overland models from $41,890, and Rubicon from $45,040. 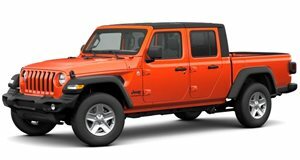 Not exactly cheap, but Jeep will have absolutely no problem selling them. What won’t be happening now or anytime soon (if ever) is an optional Hellcat V8, which we learned last week easily fits in the Gladiator and Wrangler’s engine bay. Jeep is probably wise not to offer this engine option for a number of reasons, among them safety. Over 700 hp in an SUV with removable doors and a fold-down hood? Chances are someone will do something stupid. However, the Hellcat V8 crate engine can also be ordered from Mopar, just saying.